Imagine this scene. Its night time, and the bright lights of a century old church shines bright down upon you as you are making your way up the ancient steps. Near the entrance you hear a faint choir sound which is amplified to full volume as you step foot into the Lord’s house. Welcoming you, in their full glory, is the prominent Harlem Gospel Choir projecting their beautiful sounds which echoed off the mighty high ceilings. Once inside, you're surrounded by so many different visuals. Beautiful architecture and art: statues, icons, stained glass windows. The night light going through the stained-glass windows created a beautiful kaleidoscope of colors on the walls and pillars. The place is filled with beautiful people and everyone is dressed to the nines. This scene was a reality for the hundreds of guests who attended the Lincoln Center Young Patrons Gala this past Saturday. 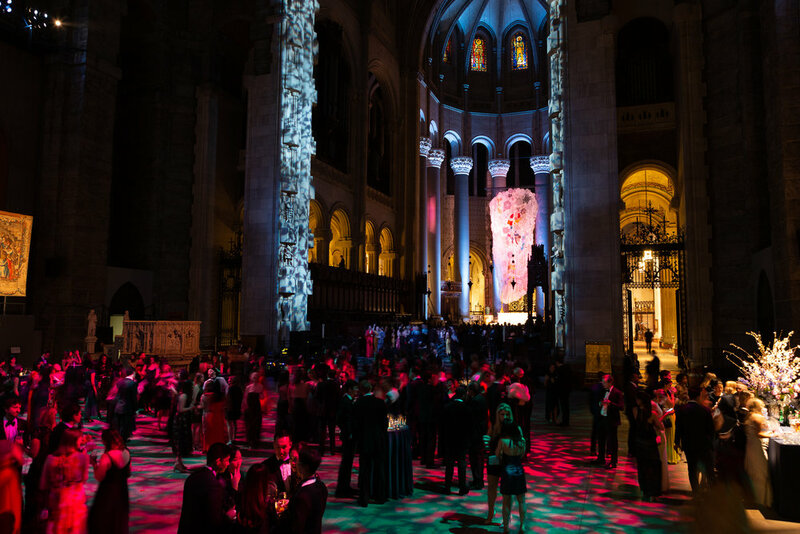 On March 22, the Lincoln Center Young Patrons (LCYP) hosted their annual gala at the Cathedral of St. John the Divine. Billed as the largest cathedral in the world, this colossal of a structure swallows its visitors and the real world suddenly feels a thousand miles away. The gala brought together 600+ New Yorkers – a mix of current Young Patrons, prospective philanthropists, and young arts enthusiasts seeking to deepen their engagement with Lincoln Center. The evening commenced with a festive cocktail reception, in which people mingled and admired the many artworks that was put on display just for the gala. The evening was lively with beats from DJ Jenny Albright and featured powerful performances by the Harlem Gospel Choir and SugarTone Brass Band. The night also saw a silent auction featuring generous donations from Max Mara, HeyDay, Blushington, Rent the Runway, among others. Over $280,000 was raised to support Lincoln Center’s arts education and audience development initiatives. No better way to spend a Saturday night than connecting with culturally minded New Yorkers who celebrate, support, and promote the world’s leading performing arts center: Lincoln Center.